Darling Oliver, has lived his life with one owner who has passed away, there were no family members who would take him. He is a wonderful dog, and devoted to his person. He takes a little bit, to be comfortable with new people, but readily adjusts. He is great in a car, good on a leash, housetrained. He is fine with other dogs, and also grew up with a cat. Since Oliver has spent his entire life with an adult, and knowing this breed, he would do well in an adult only family. Sassy is a gorgeous red Lhasa. She has a nice loving temperament. She does very well with other small dogs, and likes adults, but is shy when she first meets someone. She is uncomfortable around children, so an adult home is required for her. Sassy is now living with a super family, and her new brother Roy, the most glorious Bassett Hound I have seen, they make quite a pair. Residing in Grapeview, Washington. Rickie is a perfect tempered furbaby, he loves kids, dogs, anyone who is willing to play, he is a ball of energy, love and kisses. He will be a wonderful companion in any household. I have nothing negative I can say about him, if you love him, he will love you back. He is a beautiful reddish blonde, with the biggest brown eyes. 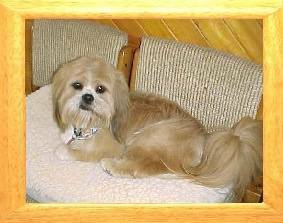 As my groomer/friend quoted "he is by far the nicest Lhasa she has ever encountered"